Wall Street watched Washington with shock and fear as the bailout package flamed out on Capital Hill. And as that $700 billion financial rescue plan went down, the Dow went down like a sub, hurtling the Dow Jones industrials down nearly 780 points in its largest one-day point drop ever, reports CBS News correspondent Anthony Mason. "Nobody could believe it," said Ted Weisberg of Seaport Securities. "The fact that it did not get done is just mind-boggling." The result on Wall Street was a history-making 777-point nosedive. The Nasdaq plunged almost 10 percent. "Wall Street is of the view something needs to be done," said Steve Masocca of Pacific Growth. "Investors are of the view something needs to be done. And it didn't get done." The financial crisis, meanwhile, continued to spread. Wachovia, burdened with bad mortgage loans, averted disaster by selling out to Citigroup. Cleveland based National City, hit by fears it could be the next victim, saw its stock plunge more than 60 percent today. Overseas economies also felt the reverberations, Mason reports. The British government had to seize a distressed mortgage bank. And the Belgian-Dutch bank, Fortis, was rescued in a $16 billion bailout. "The clock is ticking," said economist Mark Zandi. "We need to have some relief very rapidly." Zandi says the credit markets are still frozen, and Main Street could feel the effects within weeks. "I've heard from numerous businesses that they're running out of cash to operate their everyday business," Zandi said. "So that means if they don't get relief from their bankers soon, in the next few days or couple of weeks, they will be laying off workers and shutting operations." Among 160 companies in danger of defaulting over the next 12 months, according to Standards Poors are: United Airlines parent UAL; General Motors; Six Flags; and Trump Entertainment Resorts. Meanwhile, the Federal Reserve pumped $630 billion into the global financial system Monday, flooding banks with cash, trying to keep the crisis from worsening, Mason reports. Credit markets, whose turmoil helped feed the stock market's angst, froze up further amid the growing belief that the country is headed into a spreading credit and economic crisis. Stunned traders on the floor of the New York Stock Exchange, their faces tense and mouths agape, watched on TV screens as the House voted down the plan in mid-afternoon, and as they saw stock prices tumbling on their monitors. Activity on the floor became frenetic as the "sell" orders blew in. The Dow told the story of the market's despair. The blue chip index, dropped by hundreds of points in a matter of moments, and by the end of the day had passed by far its previous record for a one-day drop, 684.81, set in the first trading day after the Sept. 11, 2001, terror attacks. It takes an incredible amount of fear to set off such an intense reaction on Wall Street, and the worry now is that with the $700 billion plan fate uncertain, no one knows how the financial sector hobbled by hundreds of billions of dollars in bad mortgage bets will recover. While investors didn't believe that the plan was a panacea, and understood that it would take months for its effects to be felt, most market watchers believed it was a start toward setting the economy right after a credit crisis that began more than a year ago and that has spread overseas. "Clearly something needs to be done, and the market dropping 400 points in 10 minutes is telling you that," said Chris Johnson president of Johnson Research Group. "This isn't a market for the timid." The plan's defeat came amid more reminders of how troubled the nation's financial system is - before trading began came word that Wachovia Corp., one of the biggest banks to struggle due to rising mortgage losses, was being rescued in a buyout by Citigroup Inc. It followed the recent forced sale of Merrill Lynch & Co. and the failure of three other huge banking companies - Bear Stearns Cos., Washington Mutual Inc. and Lehman Brothers Holdings Inc.; all of them were felled by bad mortgage investments. And it raised the question: Which banks are next, and how many? The Federal Deposit Insurance Corp. has a list of over 110 banks that were in trouble in the second quarter, and that number surely has grown in the third. 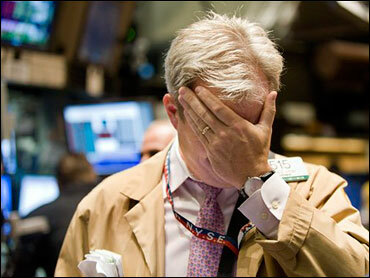 According to preliminary calculations, the Dow fell 777.68, or 6.98 percent, to 10,365.45. The decline also surpasses the 721.56-point intraday decline record also set during the first trading day after the terror attacks. Still, in percentage terms, the decline remained well below the more than 20 percent drops seen on Black Monday of October 1987 and the Depression. Broader stock indicators also tumbled. The Standard & Poor's 500 index declined 106.85, or 8.81 percent, to 1,106.42. The technology-heavy Nasdaq composite index fell 199.61, or 9.14 percent, to 1,983.73.